On my mother’s side I have an uncle who was an old school nerd. My father and him both had a Commodore 64 and spent much time “trading” games/software. While my dad stayed with Commodore, graduating to the beautiful Amiga; my uncle went the way of DOS. Both still loved seeing what the other was up to with their chosen computers. Both were nerding it up in various ways before the home computer explosion of the 1980’s. My uncle had quite the collection of hand held games from Mattel Electronics and others. Several years ago he felt they should go to someone who was into that old stuff; and he graced me with this collection. 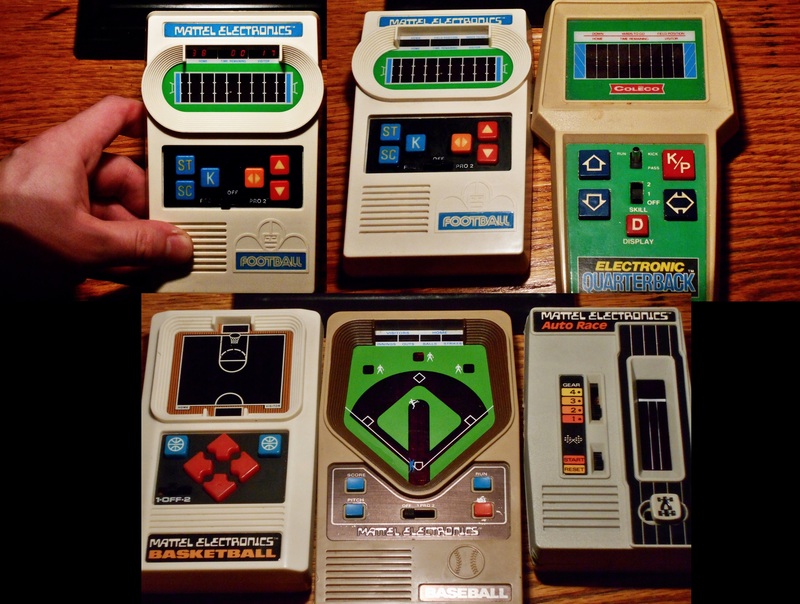 The Mattel Electronics handhelds or “pocket” games were a series of computer controlled games that you could take on the go. Milton Bradley’s Simon had been released not long before and was a huge success. With Simon, the computer program turned on various lights with the goal of repeating what you saw; Mattel set out to reproduce various sports in the palm of your hands. The first two games released were Auto Race and Football, released in 1977 through Sears. Initially 100,000 units were made with the idea that it was unlikely to be a huge seller. It became quite apparent very quickly that internal marketing was wrong on that one. By 1978 they were selling 500,000 units a week. Succeed is an understatement; countless millions were sold of their various sports games. Many others copied them, even Mattel went back to copy themselves with various upgrades. To this day they sell these games with a “classic” label. Football; along with all of their hand held’s, represented the players on field with several LED lights. In football; you are brightest light on the field. You play as both the home and visiting team on offense. The computer always plays the defense, represented by many dimmer lights on the field. There are two difficulty modes, with the harder mode having the defense play a little faster. You are the running back, and you run. There is no passing. 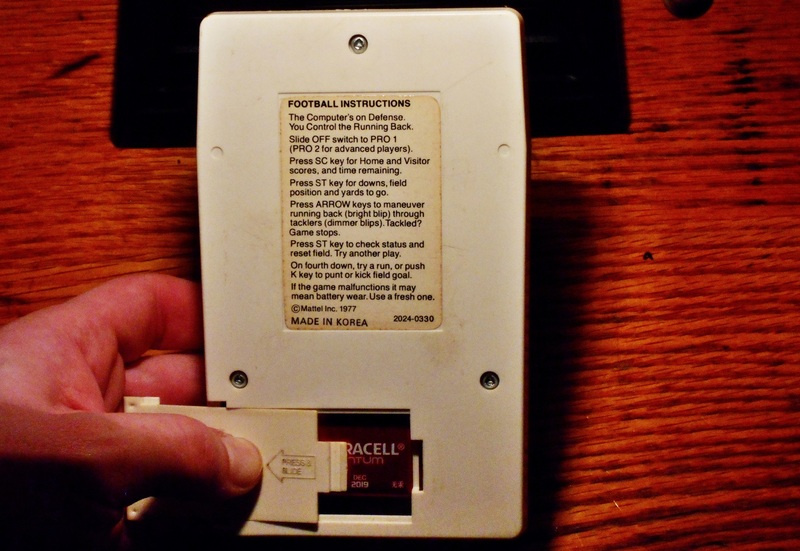 Using the arrow keys you must try to outmaneuver the computer in an attempt to score a touchdown or field goal. By 4th down if you are not in field goal range you may punt the ball and you will now play as the other team. You may check the downs, field position, and the yards to go via the ST button. With the SC button you check the home and visiting team scores as well as the time remaining. While at first glance these games may look incredibly boring and outdated; I can’t state how strongly I adore each and everyone one of these games. Football has become my new favorite since I sat down to understand how it’s played. You may very well be surprised at how little it takes to put your imagination in the thick of things. While by no means is this a simulation, it is guaranteed fun for any who give it a fair try. Many millions were sold back then, they are still being made today, get yourself some of these games, would ya? I own the newly remade baseball game by Mattel and owned a football game BITD which allowed for 2-player games (head-to-head). It was a giant orange thing by Tandy/Radio Shack, back when that brand actually meant something. I used to wear that football game OUT. If you were fast enough, there were times when I thought my player was running the length of 20 football fields. I've never seen the auto race before. I had a pure analog game instead, which I got (I think) in 1979 or 1980. It literally had a tiny steering wheel and other cars that were moved vertically on little roles of clear tape. Very weird and cool with awesome, crunchy sound. 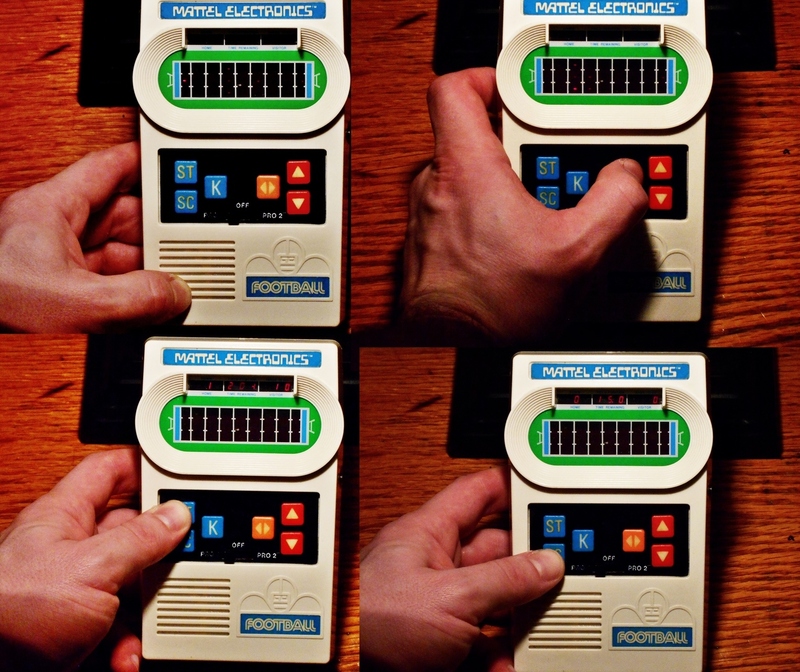 Today, my only original hand-held game from BITD that I've kept is a track and field game. So hard, but really fun. Oddly if you won the game you'd get a kiss from a girl, IIRC. I should hunt that down. It's around here somewhere. The auto raceway one looks damn familiar, I swear I've seen that IRL somewhere. Both of them look like a lot of fun, the Tandy one must have been pretty awesome with a 2nd player. How did it play (if at all) with just one? 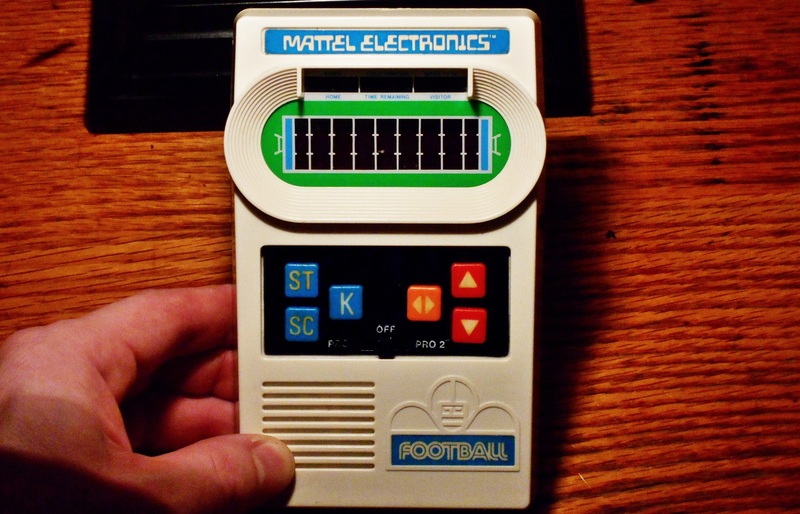 Mattel football was one of my favorites. The latest versions, though, they somewhat ruined it. The 2001/2002 versions are pretty much the same as the 1970's ones. But the 2015/2016 versions have new sound effects, new controls and the algorithm they used for defense is completely different. Hey I used to have that racing game in the first picture. That was a fun game. I don't know what happened to it I think maybe one of my brothers swiped it. I found my Track and Field game game called Track Star, which was released in 1985. I've had it since the day I received it as a gift way back then. It still works - it needs a small coin battery to operate. It's the type of LCD screen where the "graphics" are sort of like baked images that appear on and off to create the illusion of animation. Sort of like a digital watch. Graham in the background playing a little Donkey Kong Country 2 on the 1702 while I snapped this pic. Glad I never let it go - it's pretty fun. That looks pretty sweet. I used to play so many of the Tiger Electronics games... Paperboy... There was a baseball game I remember... Even Sonic the Hedgehog got a Tiger game. There was a Star Trek one... Driving ones... I had a lot of fun with them even though a lot of people like to bash them these days. There was one driving one I remember that was a lot like Auto Race from Mattel; it was not from Tiger though... I remember it being orange... Rectangular shape... Just move your car left or right in and out of traffic... Watch batteries... Always seemed to be a big deal for my parents to get me some damn watch batteries for that game! Must have lost that during some move or another. No idea what it was even called. Then there were those weird hybrids that were more physical but were under the same category to me as a kid... That thing where you put water in it and used buttons to blow air to get rings around a cone inside... Wish I still had that too! Oh yeah, I had one of those with a soccer theme which I think I got in the late 70's in Singapore. It was a very simple but fun concept. Eventually it started to leak (maybe the tap-fill stopper or something... I forget). Totally mechanical. Mine looked just like this, but had green plastic instead. And ya know, even though it's really no different from the one I played; Somehow I think I would have had more fun with that soccer one you had... Imagination! I grew up on Mattel Football. When they did the 'Classic' series some years back and rereleased it, yup, picked it up again. The wife was like.. "That is so lame". Then she got a hold of it and played constantly.